Years ago, our Pugsley’s 3.8″ Endomorph tires and 65mm-wide Large Marge rims introduced the cycling world to new riding possibilities. Our big tires, run at low pressures, get you over terrain that is difficult or impossible to ride on a ‘regular’ bike. That original Pugsley tire/rim format certainly changed the game, but there are places and conditions that beg for a larger tire footprint. So, to satisfy our cravings for increased traction action, we introduced the 82mm-wide Rolling Darryl rim. Darryl spreads out the tire more than Marge does, effectively presenting more tread to the trail and adding traction potential. Bigger can be better. Not wanting to be limited to using the 82mm rim/3.8″ tire combo (the largest recommended for the Pugsley), we decided that it was time to raise the bar and develop higher-volume tires, wider rims and a frame to accommodate them. So, this year, we offer you the Big Fat Larry 4.7″ tire, the 100mm-wide Clown Shoe rim and, of course, the Moonlander frameset. Like all of our framesets, the Moonlander is made of Surly 4130 CroMoly steel. It features 135mm-spaced, 28mm-offset, rear-loading Surly horizontal dropouts (track ends) with a derailleur hanger…meaning you can set it up as a singlespeed or geared bike, derailleured or internally geared. The bottom bracket height gives you clearance for bushwhacking and monster-trucking. The dropped and gusseted top tube maximizes standover height. And the tallish headtube allows you to set your rig up with a comfortable riding position for those long days grinding out miles in the saddle. Moonlander’s fork measures 447mm axle-to-crown…same as the Pug, so all of our fat forks are interchangeable between the two models. The disc mount allows you to use a front disc brake caliper with a 135mm O.L.D. rear hub…or with a 135mm-spaced Surly front hub. Mid-blade thru-eyelets and lower rack barrels are included for installing fenders and racks. 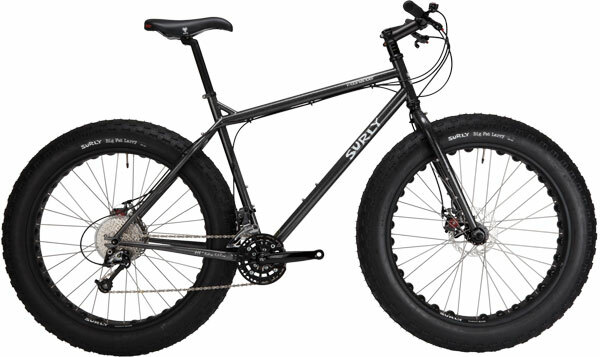 We offer the Moonlander as a frameset and as a complete bike. The complete bike components were chosen for their durability and their suitability to the task at hand. We chose thumbshifters because they allow you to shift even when wearing mittens. To accommodate the Clown Shoe rim/Big Fat Larry tire spec, the frame design pushes the chainline even farther outboard than that of the Pugsley. So we spec’d Moonlander with our new MWOD crank system. The MWOD (Mr. Whirly Offset Double) ditches the big ring and moves the middle and granny ring outboard. The 2 x 9 drivetrain offers the gear ratios most applicable to a bike of this type while avoiding chain/tire interference. Works like a charm. If you’ve ever wanted a little more float and traction to get you over the hills and through the woods to Grandmother’s House of Ill Repute and Freestyle Taxidermy, consider the Moonlander.